Nestled among the trees at the entrance to the Virginia Creeper Trail in Historic Abingdon, Virginia, lies Cottages on the Creeper. This enchanting and 'artfully' decorated cottage has been totally recrafted. It has many luxurious amenities, while maintaining its distinctive charm and character. Arched entryways, mellow colors and vibrant fabric evoke a French provencial home that welcomes you with warmth and comfort. The tastefully furnished living area invites you to sit..relax..enjoy a good book. While the fully equipped kitchen and dining areas contain some of the most creative touches. There are two queen-sized beds which are joined by a bathroom with a Jacuzzi tub and a walk-in ceramic shower. Perfect after a vigorous bike ride or a hard day of shopping. Like to dine outdoors? You will find an enclosed, beautifully landscaped brick patio to enjoy your morning coffee or sit quietly and watch a vibrant sunset over the Virginia mountains. Bill and Char purchased this Cottage and did major renovation. We have added family antiques as well as local art that we have purchased over the years. It is a 'home away from home' to us. We do allow small pets because we are animal lovers and have a beautiful red bloodhound who occasionally answers to Coltrane. We love Abingdon and wanted to share the fun of riding on the Virginia Creeper Trail, the wonderful Barter Theatre and our great restaurants. Everything is just steps away! It is great to sit on the patio, drinking a cup of fresh brewed coffee and watch the sun rise oveer the mountains. The Cottages is comfortable and relaxing. It is easy to curl up on the couch on a rainy day and read one of the good books that are available. 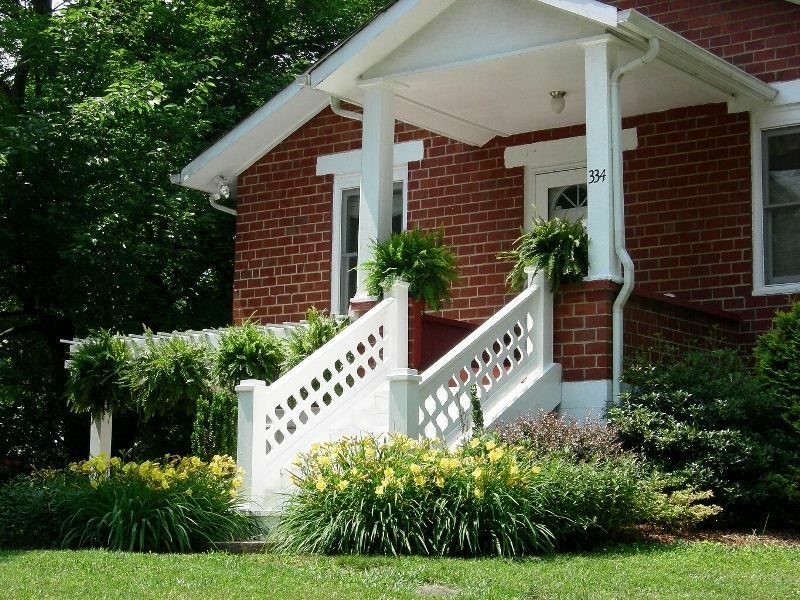 This Cottages is directly across from the Virginia Creeper Trail and is located in Historic Abingdon. Couldn’t get any closer to the Creeper trailhead. Abingdon and specifically the Cottage on the Creeper is the perfect spot to soak in all this beautiful area has to offer to us. The beautifully appointed 2 bedroom cottage is right across the street from the Virginia Creeper Trail. We've utilized it almost every day. The trains that run along the track a block away only add to the historic feel of the town. In addition to the Trail, it's an easy walk to Barter Theater, restaurants, Wolf Hills Brewery, shops and the Farmers Market held twice weekly. We've stayed here 8 weeks this trip & 6 weeks 4 years ago. This is the loveliest decor & most thoroughly furnished/stocked rental we've found. If anything is needed, Charlene and Bill get it to you asap. They are ready to answer any questions you may have. So nice to have you back in Abingdon! We are glad the weather has been so nice and sunny and very little rain. We are happy that you have taken advantage of everything that Abingdon has to offer! My husband and I really enjoyed our stay here. The house was charming. Very clean. Steps away from the Virginia Creeper Trail and the Virginia Creeper Bike Shop. We had a wonderful, relaxing long weekend, and we loved having a sweet little house to return to at night or to hang out on the patio. Charlene was responsive and friendly. We’re already trying to plan a trip next year and bringing our kids! I am so glad you enjoyed your stay at our Cottage and your visit to Abingdon! There are so many activities to enjoy....or not! This is our third time staying at the cottage and it is always a relaxing and convenient escape! We love the fact that we are literally footsteps from the VA Creeper Trail as well as a handful of great restaurants (128 Pecan is our favorite!). The accommodations are wonderful and the owners responsive. I hesitate to say how much we enjoy it because I would like to consider it a well-kept secret! Will be back again - hopefully soon! Thank you for your wonderful review. We will always get our prior visitors back to our Cottages. We love our animal friends! What we do without them! Wonderful Stay- We Will Be Back! We stayed at the cottage a few weeks ago and loved it. I don't think we have ever stayed at a rental that was so clean with so many personal touches- fresh flowers, homemade banana bread, etc. The cottage is beautifully decorated. We enjoyed the whirlpool tub. The book created by the owner with all the menus and information is very helpful. We found some great places to eat and really loved the local Farmer's Market. We will definitely be back and are already planning a trip for sometime in 2016. What a treasure this cottage was for us - enough so a few of us stayed an extra week! The location is perfect- walking across the street to the Creeper Trail every morning, and a few blocks to everything else Abingdon was really beyond what we could have hoped for. The cottage is lovely and we immediately felt at home. Enjoyed cooking our farmer's market goodies in the beautiful kitchen and relaxing the end of the day in the cute living area. The beds are wonderful and bath perfect. Your personal touch is seen everywhere. THANK YOU for sharing!! Look forward to a return visit in October. Thank you for your terrific review! We want you to return and to think of our Cottage as your home away from home. We try to give a synopsis of the many attractions to see and to do in our favorite town of Abingdon. We have tried to add "little extras" so your visit will be more memorable. We are so fortunate to have so many locally owned restaurants and numerous activities to try. Our Cottage is ideal. It is located across from the Virginia Creeper Trail which is a hiking and biking trail and also in historic Abingdon. You can walk to many of the shops and spectacular restaurants.